Coral Springs, Fla., September 7, 2018 – With nine Travel Weekly 2018 Magellan Awards to add to its awards shelf, Cruise Planners, an American Express Travel Representative, continues to pave the way for franchise companies as a MarTech powerhouse. These awards represent the combined efforts of Cruise Planners’ internal Marketing, Technology, Business Development and Training Teams who work with Cruise Planners’ nationwide network of travel advisors to develop the tools travel advisors need to be competitive in the travel industry. 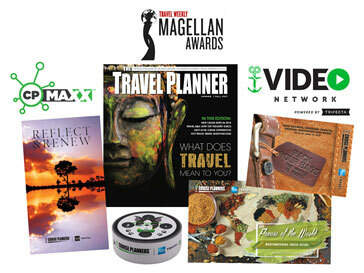 Cruise Planners won nine Magellan Awards for video marketing, automatic technology programs and creative marketing campaigns. Pack Your Bags, the World is Yours – Direct mail and digital campaign highlighting cruise and land vacations in bucket-list destinations around the world. MarTech – the intersection of marketing and technology – is the blending of two essential business tools to grow Cruise Planners travel advisors’ sales by making marketing efforts more effective using time-saving, intuitive technology while increasing the level of customer service and human connection travel advisors are able to provide. Cruise Planners has recently won multiple awards for its MarTech initiatives including the CLIA’s Innovator of the Year Hall of Fame Award and the International Franchise Association’s FranTech Award for Innovation. How does MarTech benefit travel advisors? Cruise Planners uses technology to make travel advisors’ marketing efforts more targeted and therefore more effective. When sending a direct mail piece, such as the winning “Reflect & Renew” luxury land travel piece, Cruise Planners travel advisors log into CP Maxx, a proprietary booking and management system, through which they can view their segmented lists of luxury clients as determined by CP Insights. CP Insights is designed to choose the right clients for each marketing piece based on previous purchases coupled with psychographic and demographic details allowing each campaign to reach clients with relevant, customized travel offers. All of Cruise Planners tools integrate seamlessly, making their combined usage simple and quick for the travel advisor. Cruise Planners travel advisors and Home Office Team will come together for its annual Convention November 26-29, 2018 in Hollywood, Fla. followed by an inaugural sailing on the new Celebrity Edge. where agents will receive the latest updates on and hands-on training with Cruise Planners MarTech advancements.